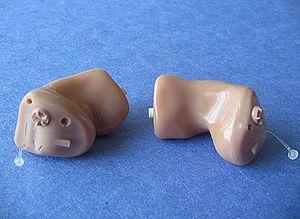 Deafness stands for a condition where one is incapable of registering certain sound frequencies. Even though hearing impairment is the most common term describing this condition, it is not preferred by the affected people. Rather, they commonly use deaf or hard-of-hearing for describing people with this problem. Most deaf children and adults have access to public education which is free. However, before a child may enter such an institution, his/her age, level of impairment and numerous other facts need to be taken into consideration. The affected child will need to communicate and exchange information with his/her peers and the education needs to accommodate the needs of each individual with a hearing problem. The US Department of Education distinguishes hearing loss and deafness, describing the latter as a stage of hearing loss where a person is not capable of hearing, even with the assistance of hearing aids or other hearing assistance devices. Furthermore, this institution classifies hearing impairment through levels of one's educational problems affected by hearing complications he/she suffers from. Therefore, in order to have rights to regular public education, a person with hearing problems needs to be capable of registering more than 20 decibels. So, children with hearing loss may experience problems regarding education. Yet, there are adequate choices in this respect, available for all people with hearing disabilities. Nevertheless, these are different for individuals living in deaf communities, using sign language only, those whose parents are deaf as well or those who do not reside in such environments. Nowadays, inclusion laws give rights to children with hearing impairment, allowing them to receive education in all public schools. People with hearing problems, or those whose children have these problems, usually choose schools with less restrictions. This is mainly due to the fact that resources found in most public schools do not match the needs of children with hearing impairment. Parents may be commonly told that public schools are mainstream and allow their deaf children proper education. Yet, this is not always the case. Therefore, many parents, especially those living in deaf communities, prefer enrolling their children into schools for deaf, where all their classmates share hearing impairment. Here, the school staff and the teachers are more aware of the needs of such students and may accommodate learning more adequately than in other schools. After all, a deaf child may face a language barrier once he/she enters a general education classroom. However, in residential schools, all children use the same language, communicating between themselves without problems, learning more and avoiding being ridiculed or bullied due to their impairment. Basically, in such environment, the impairment ceases to exist and children learn more through communicating with their peers and teachers freely and without sound or language constraints. What Would Cause One To Abandon Their Children? what is it with teen and their parents? Does Watching TV Helps or Harms Babies?